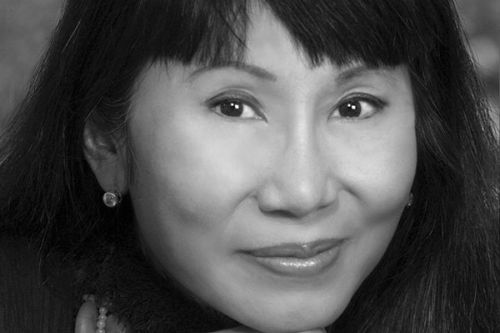 Amy Tan is an American author of Chinese American literature, best known for her novel The Joy Luck Club. She has appeared on The Simpsons in animated form. A major theme of her work is the exploration of the relationship between mother and daughter. When she was a teenager, her brother and father both died of brain tumors at almost the same time. After a move to Switzerland, Amy’s mother revealed that she had three daughters in China that she had with an abusive husband. Amy lives in California with her husband, Louis, who she met on a blind date. Notes: The Best American Short Stories 1999 was co-edited by series editor Katrina Kenison. Mid-Life Confidential: The Rock Bottom Remainders Tour America with Three Chords and an Attitude was co-authored with Dave Barry, Stephen King, Tabitha King, Barbara Kingsolver and Ridley Pearson. Hard Listening is written with fellow Rock Bottom Remainders band members Mitch Albom, Dave Barry, Sam Barry, Matt Groening, Roy Blount Jr., Stephen King, James McBride, Ridley Pearson and Scott Turow. Amy Tan Synopsis: The Joy Luck Club is the debut novel from Amy Tan, was translated into 35 languages and adapted to film. It is the story of four mothers, four daughters and four families whose stories change based on who is telling the stories. In 1949, four Chinese immigrant women to San Francisco eat dim sum, play mahjong and chat. They call themselves The Joy Luck Club.